A toolkit for building streaming audio projects, featuring Polyphonic Playback, Recording, Synthesis, Analysis, Effects, Filtering, Mixing, Multiple Simultaneous Inputs & Outputs, and Flexible Internal Signal Routing. Tutorial examples from this video are available in Arduino, from File > Examples > Audio > Tutorial. 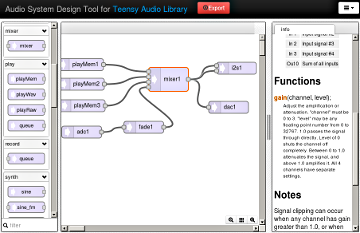 Use this deisng tool to draw your audio system, and then export as code to Arduino! Audio Adaptor, for 16 bit stereo input and output. Dual Audio Adaptors for 16 bit quad channel input and output. S/PDIF optical digital audio output, for 16 bit stereo sound. Teensy 3.6, Teensy 3.5, Teensy 3.2 & 3.1 built-in DAC, for 12 bit mono output. Teensy 3.6 and Teensy 3.5 built-in DACs, for 12 bit stereo output. Teensy 3.6, Teensy 3.5, Teensy 3.2 & 3.1 & 3.0 ADC, for 13 bit mono input. Teensy 3.6, Teensy 3.5, Teensy 3.2 & 3.1 ADCs, for 13 bit stereo input. Teensy 3.6, Teensy 3.5, Teensy 3.2 & 3.1 & 3.0 PWM, for approx 9-10 bit mono output. USB Audio, for bi-directional stereo streaming to/from a PC.